The Black bear season is May 1 to June 30. We hunt out of our base camp lodge. There is a cook there to make breakfast and dinner. She will send us out for the day with a bag lunch. We start the day at day light. And end at dark. It usually gets dark at 10 pm. But we can come back to camp during the day if we need too. Our bear hunts are spot and stalk. Or we can run them with dogs. Running the bear with dogs is a very exciting thrill to get to see the dogs work. We can only run our dogs in the morning because it gets too hot for the dogs in the afternoon. It is really fun if we can use dogs in the morning then spot and stalk in the afternoon. When we use dogs; we put a strike dog on top of the dog box and she will let us know when she smells a bear. We have a lot of colored black bear here. We are 60% color phase. You can expect colors such as cinnamon, blonde, and chocolate. 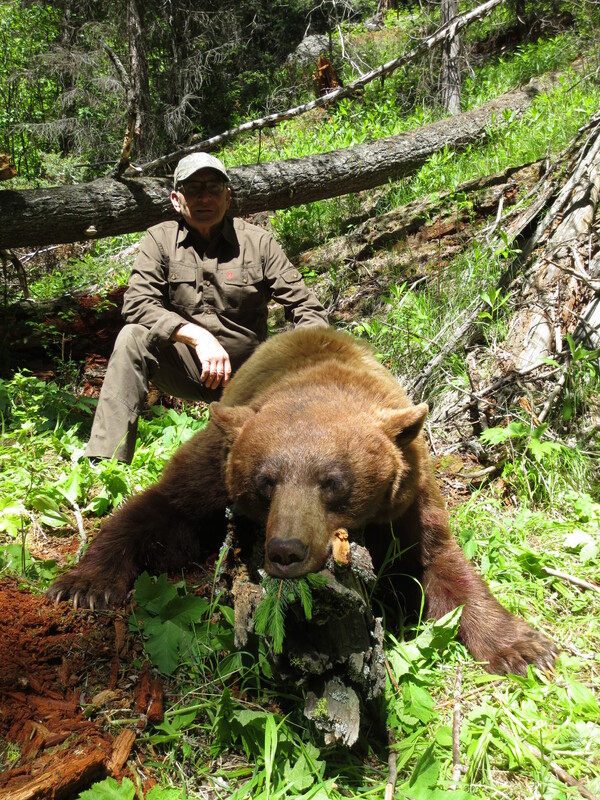 Our average bear square 6 foot and the big ones square 7 to 7 ½.